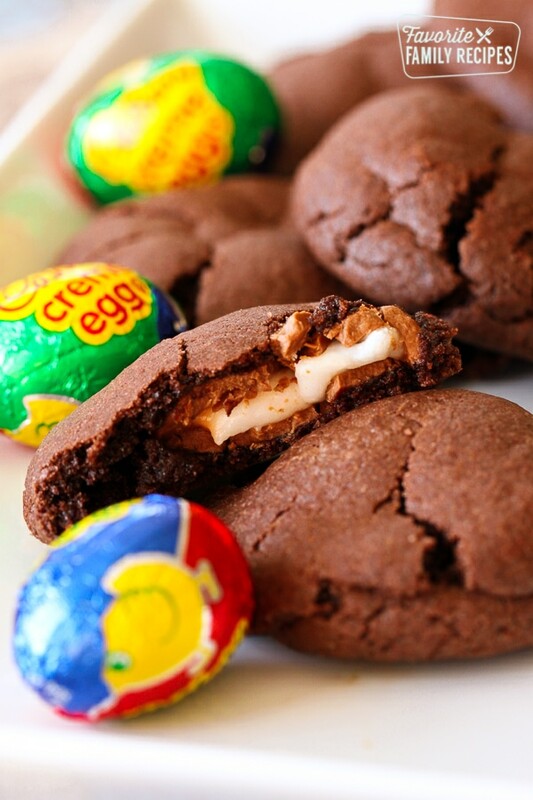 Cadbury Creme Eggs stuffed into a cookie? YES, PLEASE. 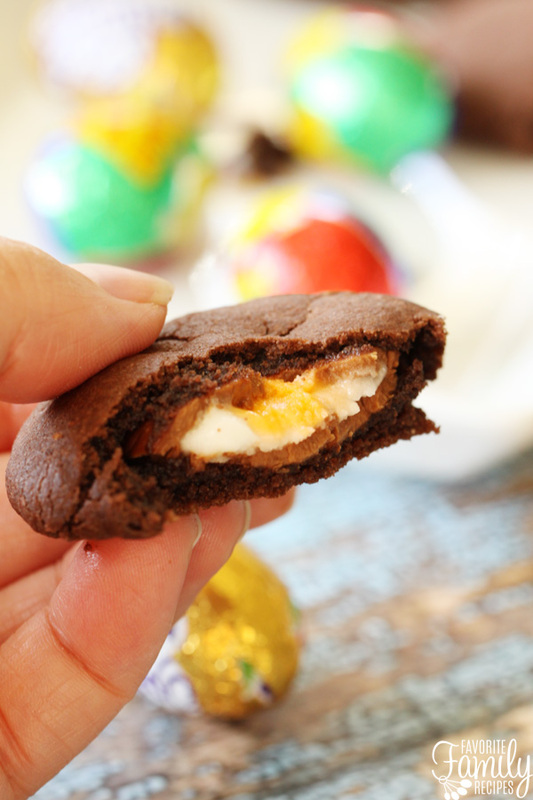 These little morsels are so chocolatey, creamy, and rich, they will quickly become your favorite Easter cookies. We just took some of our favorite Easter candy to the next level. 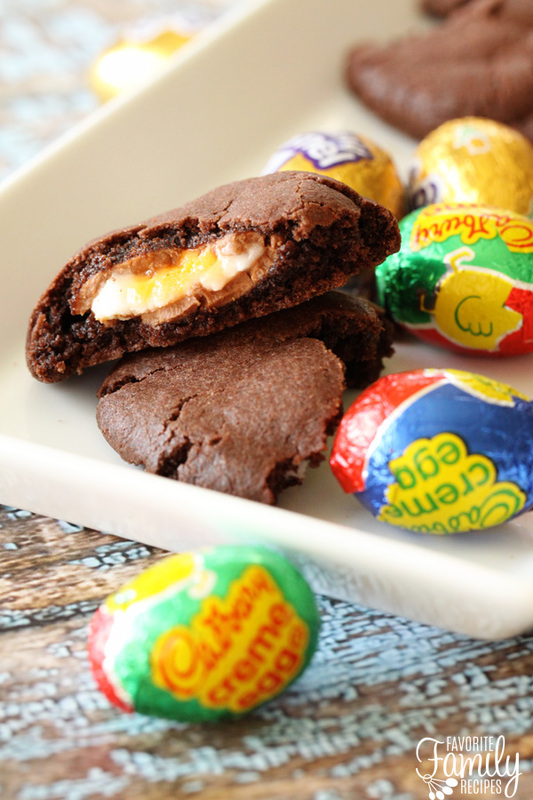 I mean, what could be better than a warm chocolate cookie with a Cadbury Creme egg stuffed inside? I will tell you. Not much. The melted chocolate and creme inside is as delicious as you are imagining right now. Probably better. For this recipe it is important to note that Cadbury Easter Mini Creme Eggs are NOT the mini eggs that have the hard candy shell on the outside. Although we do have a recipe using those HERE (if that is what you are looking for). These mini eggs are the kind that have the foil wrapping and look just like the original Cadbury Creme Egg. Just smaller. They usually come in a plastic carton of 12. So for this recipe you will just need 2 of those cartons. For this recipe you can also use the Cadbury Mini Caramel Eggs instead of the Cadbury Easter Mini Creme Eggs. As the saying goes: “There’s more than one way to stuff a cookie”. That’s how that saying goes, right? My husband actually liked the caramel egg Easter cookies better. I liked the Creme Egg Easter cookies best. Totally a personal preference here. You can use any kind of cake mix that you would like for these cookies. I like to use the Devil’s Food cake because it makes them extra rich and I love the flavor. You can use German chocolate or regular chocolate as well. If you aren’t big into chocolate cookies or cake mix cookies, you can easily make chocolate chip cookies stuffed with the Cadbury Eggs as well. You can use our recipe HERE and roll the dough around each chocolate Cadbury Mini Creme Egg. If you do it this way, the baking times and temps will be the same as in the recipe below. Mix cake mix, eggs, and oil until cookie dough consistency. Take a small amount of dough and form a ball around each Cadbury Easter Mini Creme Egg. Be sure to only use just enough dough to cover the chocolate egg. Place each stuffed cookie dough ball onto a greased cookie sheet and bake 7-8 minutes (do not over bake). Remove from oven and allow to cook slightly before serving. Tastes best when served warm!